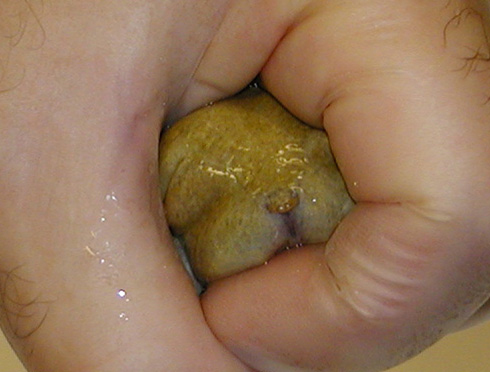 The small size of the X. tropicalis makes the use of the traditional X. laevis methods of embryo collection very difficult. Therefore, we have developed a new method of embryo collection for this species, which is based on the peculiarities of the behavior of X. tropicalisduring spawning. 1) The first stage is calm. It begins 1.5-2 hour after final injection and takes place over 15-60 minutes. The behaviors are very similar to the spawning habits of the X.laevis. The male grabs the female and the couple starts to move around dispersing embryos. Periodically they stop for rest. 2) The first step gradually escalates into the second - ecstasy step, which is characterized by the frogs periodic frenzied and quick movements, and by their turning over onto their backs (Fig. 7 and 8). The male holds onto the female tightly, so it is easy to move the couple into a different container for short period of time. In most cases, this can be done without interrupting the spawning process. 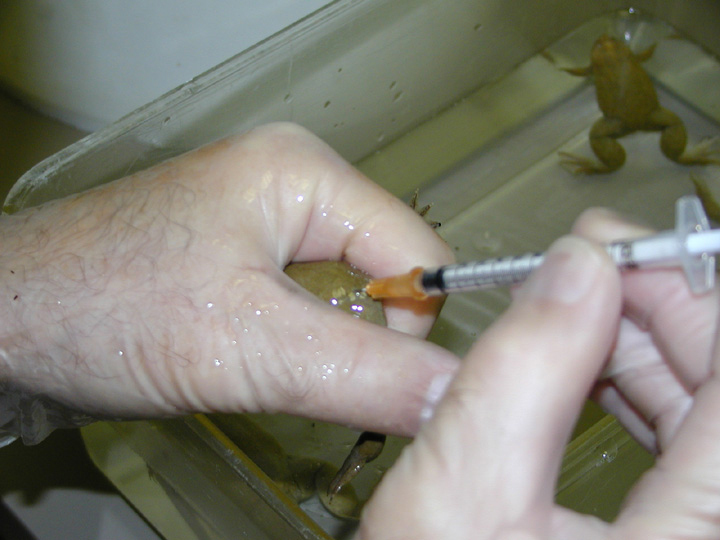 The intensity and consistency of the spawning depends on the health of the frogs and on the amount of hormone injected. 1) Dilute Chorionic Gonadotropin with distilled water so that the final concentration is 1500 IU/ml. Fill a 1 ml syringe with the hormone, and use a 26-gauge needle. 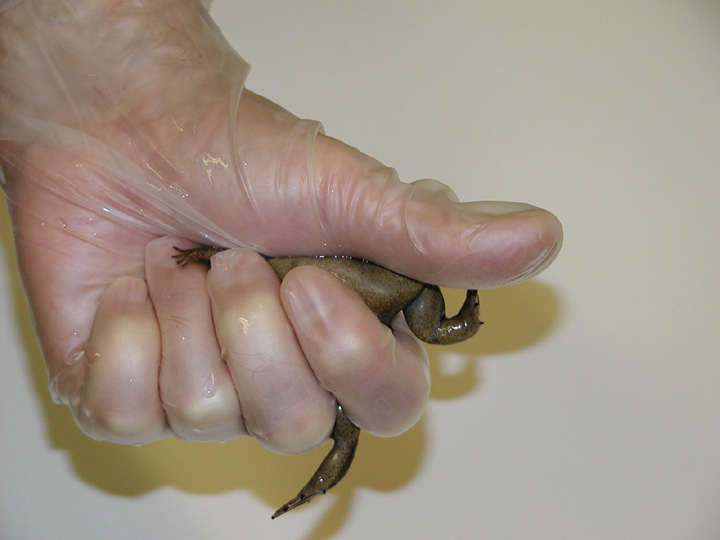 2) Take the frog in your hand so that the dorsal side is against your palm and the back legs are placed between your index finger (Fig. 1). 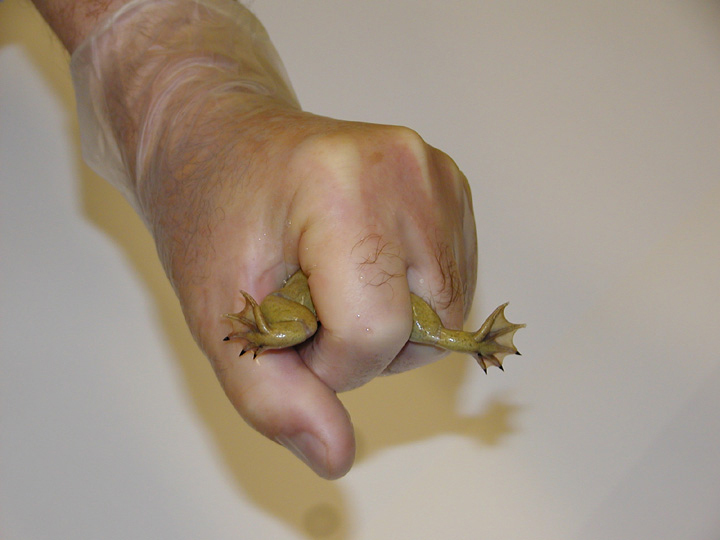 Hold the back right leg firmly between the index and middle fingers, which will temporarily stop the frog from moving (Fig. 2). Using your thumb move the back left leg so as to clear a space for the injection (Fig. 3). Be careful not to stretch the leg too tightly. 3) Inject hormone into the dorsal lymph sac (Fig. 4 and 5). Make sure that only half the length of the needle is forced into the frog’s body. Inject females with 0.1ml and males with 0.05ml. Leave the needle in the body for a second after the injection, so as to prevent the fluid from leaking out. This entire procedure must be done quickly, and due to the small size of the X. tropicalis, requires practice. 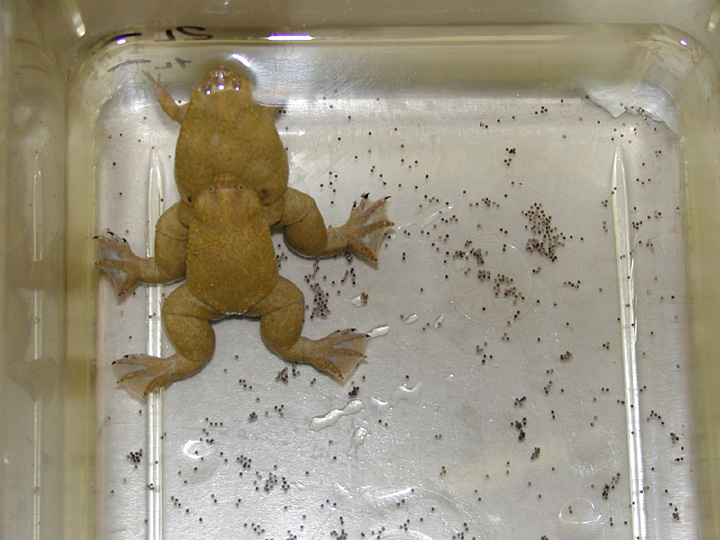 1) Inject two females and three males and place them together into an adequately sized aquarium contain of frog system water (conductivity = 1.5 + /- 0.2 siemens, Temp. = 26 +/ -1°C) with the height of the water approximately 2 inches from the bottom. Cover the aquarium with a perforated lid. 2) 1.5 to 2 hours later, the male will grab the female, which marks the beginning of spawning (Fig. 6). At this time transfer the linked couple into a different aquarium with the same conditions and give them another 15-60 minutes to let the process increase in intensity. 3) After the frogs start to regularly turn over (Fig. 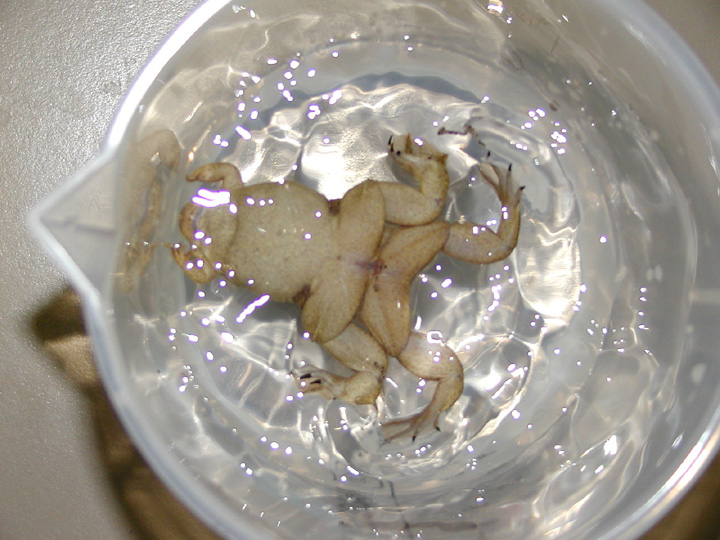 7), carefully move the coupled frogs into a 1 L glass or Nalgene beaker containing 400 ml of 0.1 x MBS (Fig. 8). In this beaker the frogs will deposit the embryos. In the majority of the cases, the couple will not separate and will continue spawning, however, in the cases where the male leaves the female you might have to wait for them to reunite in order for the spawning process to continue. 4) The above method was used for collection of 3-4 sets of embryos. 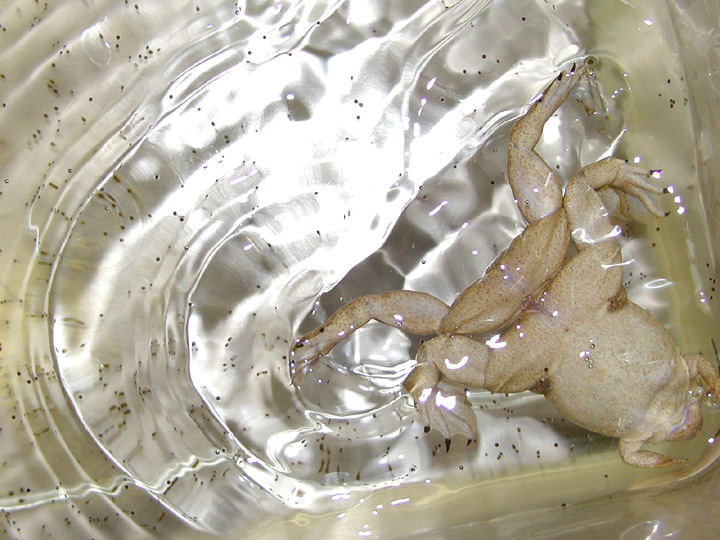 If the frogs spawn intensely, 10-20 min is enough to collect 200-400 embryos, which is usually enough for one experiment. You can then transfer the couple into another glass beaker and collect additional embryos so that each beaker contains a set of embryos that are at approximately the same stage. One couple or pair of frogs can produce up to 3000-5000 embryos during one whole spawning process. It is important to note that the eggs in the glass/beaker are clumped together because of the frogs’ movement. The embryos should be placed into Petri dishes and the clumps removed soon after the embryos are deposited. This will allow equivalent oxygenation to each embryo, which will permit equal development time and prevent suffocation. The process of spawning continues for 2-4 hours and the optimal collection time is limited to 1-2 hours. The collected egg samples should be processed immediately after they have been collected, as the embryos are in clumps and may suffocate. 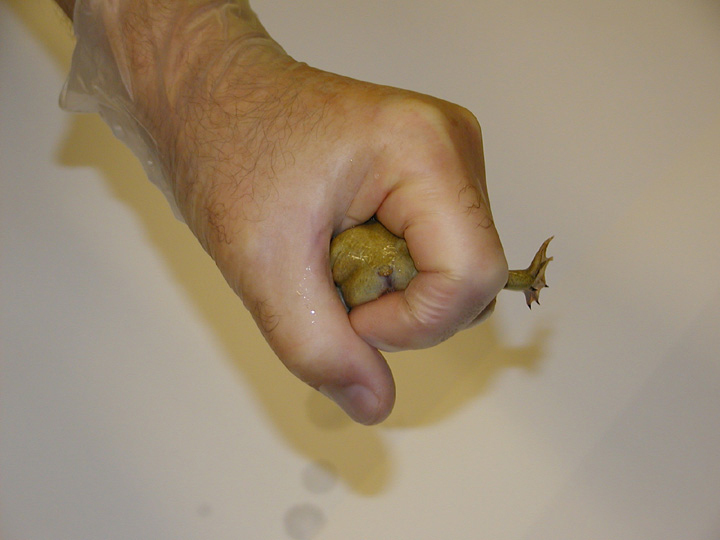 Hold the frog with it's back against your palm and your index finger between it's legs. Hold the right leg between the index and middle fingers. Move left leg under your thumb. Couple flip over to back. If you have any questions about this method or how we care for frogs here at the Sive Lab, feel free to forward them to Castera Bresilla, at cas@wi.mit.edu.